Mower Magic is an award-winning, family run business specialising in Garden Machinery. We are an Authorised Dealer for Mountfield, Stiga, Hayter, Stihl, Cobra, Greenworks, Handy and many other top brands. We are the UK national distributor for the Robomow and Zucchetti Ambrogio range of robotic lawnmowers. 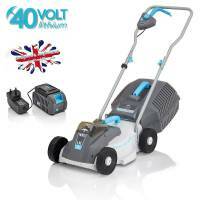 Mower Magic deals in a huge range of domestic and professional gardening and lawncare products, with many available for next day delivery. Also check out our Special Offers! Customer care is our main priority, from impartial pre-sales advice right through to the after sales service, so if you have any questions please give us a call at the number above. 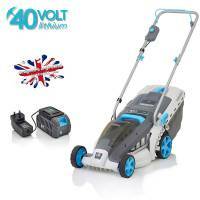 A brand new range of Robotic Lawnmowers is now available from Mower Magic. We are the UK Distributor for Zucchetti Ambrogio - the superb range of high-quality Italian machines. From small gardens to huge formal lawns - there is a robot suitable for you. Click here to see the range..
We offer finance on all orders over £500 - you could drive away a Ride-On mower today for a deposit of just £129.90! If you think your garden is too small for a ride-on mower think again! Lawn riders are small enough to drive through a standard garden gate and are easy to use. If you have a large garden with over an acre of grass then a lawn tractor is what you need. Mountfield are the best selling tractors in the UK and have a large choice of great value models available. Click to see the range..
Webb garden machinery is built with practicality in mind, The machines are easy to use and easy to maintain. They are designed for busy people who want a machine that will give them the finest quality finish in record time. You can also be assured that Webb are concerned with more than just the greenness of your grass, the machines are environmentally friendly with low emission, energy efficient engines. Webb machines are designed, built and supported to the highest standard, as you would expect from a quality brand. Mower Magic are an Authorised Webb Service Dealer.